There is no one answer to the question of how to drink Darjeeling tea. I have drunk many Darjeeling teas some of which I have reviewed on this blog. I have prepared Darjeeling teas using a cupping set, in a teapot/Western style, and with a gaiwan. I prefer to drink Darjeeling that's been cupped, i.e. prepared in a cupping set. Before I dive into the teaware, here's what is Darjeeling in three sentences. 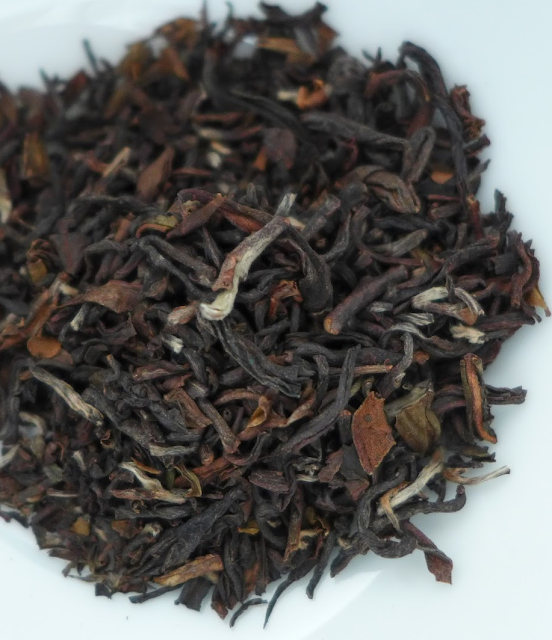 Darjeeling teas are produced mostly from Camellia sinensis var. sinensis plants grown in Darjeeling region of India. The word Darjeeling translates to "queen of the hills""Land of the Thunderbolt"* and Darjeeling the tea is known as the "champagne of teas." By the way, Darjeeling teas were the first Indian product to receive the Appellation d'Origine Contrôlée (Geographic Indication of Goods) designation. Steeping Darjeeling in a professional cupping set yields the perfect (small) cup of tea. (I drink mine without milk.) There's a historical connection between the cupping set and Darjeeling. 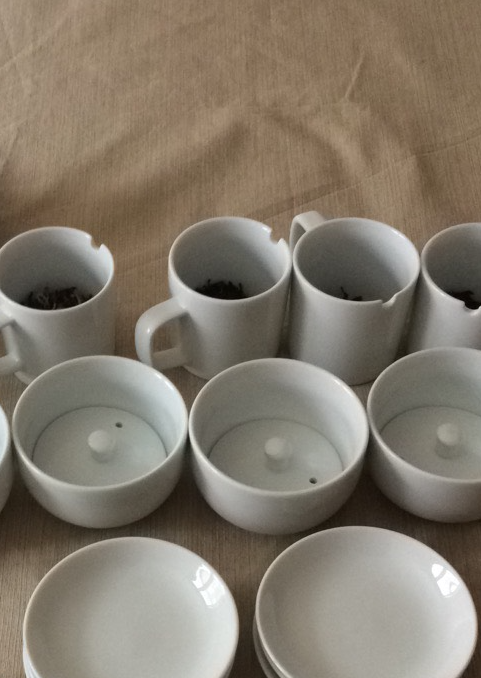 The professional cupping set was developed to evaluate Indian (and Sri Lankan) teas. Tea heads will tell you that the gaiwan (and gongfu method) is the way to prepare loose leaf tea. This is hard dispute in the case of Chinese and Taiwanese oolongs and puerhs. But the cupping set works better for Indian teas. If you have both a cupping set and a gaiwan, pause here and place them side-by-side. See a resemblance? The professional cupping was inspired by the gaiwan! (I didn't know this until I took the ITEI tea sommelier course.) In the same way that the gongfu method with gaiwan of small volume, heavy leaf, and short infusions highlights the transformation in oolongs and puerhs, the cupping process of small volume, light leaf, and long infusion plays to the best of a Darjeeling and other Indian black teas. Like a gaiwan, the cupping set is challenging on the pour. This is wear the lid can slip and the liquor and leaves spill. The cup handle does give it a leg up on the gaiwan and the thick porcelain of the cupping set doesn't transmit heat as quickly. Weigh 2 grams (or your choice) of tea and add it to the infusion cup. Pour hot water in a swirling motion into the cup until it brims then cover with the lid. Infuse the leaves for 3 minutes (or to your preferred time). To pour, hold the bowl in your hand and tip it 90 degrees. Fit the lidded cup into the bowl then flip the bowl 90 degree counter clockwise and set it down. Or, you could pour the liquor directly from the lidded cup into the bowl as you would a gaiwan or teapot. Either way, drain completely. Flip over the cup to dislodge the leaves so they fall onto the lid. Smell the infused leaves, then place the lid upside down on the infusion cup to display them, if you like. Sip, or more accurately slurp, the liquor with a spoon or directly from the bowl. There are various ratios for leaf:water:steep time. The key is to be consistent. As you prepare tea in a cupping set, you'll figure out if your preference for these variables especially the first and third ones. The typical cupping set includes a cup with a 4-ounce capacity in addition to a lid and a drinking bowl. I like to use 2 grams of tea and infuse for 3 minutes. You can resteep your leaves 1-2 times more adding 30 seconds each time. 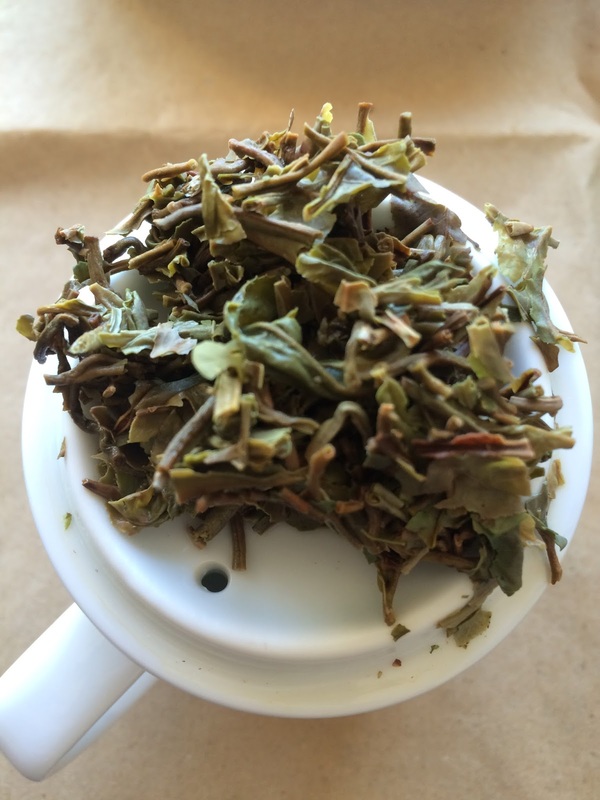 I use 200-212F for second flush Darjeelings and 195-200F for first flushes. More on the Darjeeling harvests below. After numerous enjoyable cups of Darjeeling teas, my preference, for now, is Darjeeling Second Flush.There are four harvest per year of tea in Darjeeling. The first flush is in the spring, February to April approximately, and is fairly limited in production. The liquor is light colored and bodies with smell and taste of vegetables, almond, flowers, and fruit. The second flush or summer harvest of May to June is much higher volume production wise. The liquor is dark and copper colored. The tea is malty, woody, fruity, full bodied, and astringent. I don't have much experience with the the fourth (autumn) flush and even less with the third (monsoon) flush. The latter is supposedly woody and spicy with forward ripe fruit and a full body. While I've used my cupping sets for comparative tastings as the cupping set was designed to be used, I've also used a set to prepare a Darjeeling to enjoy on its own terms. And without milk! Let me know how you drink your Darjeelings. In closing, I'd like to give a shout-out to the International Tea Education Institute (ITEI) Tea Sommelier course I completed. I learned so much. You can use the NOTESONTEA10 discount code if you'd like to take a course with ITEI. *The revised translation was provided by Lazy Literatus. Excellent post! I have only just started using a cupping set and pouring with it definitely takes practice. Autumn flush Darjeeling is quite lovely but it has been years since I've had one. Hi Nicole, I really appreciate your comment on the post!